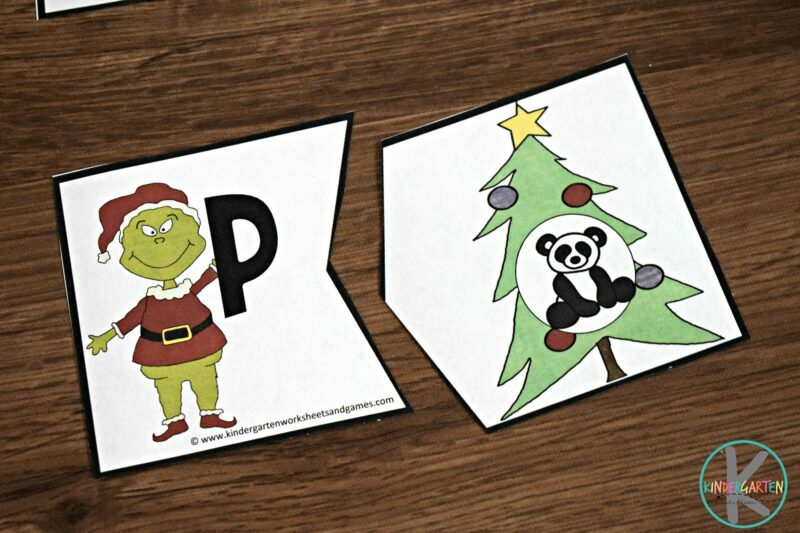 This super cute and easy to make Grinch theme party is sure to be a hit for classroom parties, preschool fun, or a December birthday party. My youngest daughter has a birthday when the Christmas decorations are already up. That makes it a little tricky to have a theme when your house is already themed for Christmas. Then it hit me, a Grinch theme party would be perfect! It was super cute and a huge hit so I thought I’d share it with you. 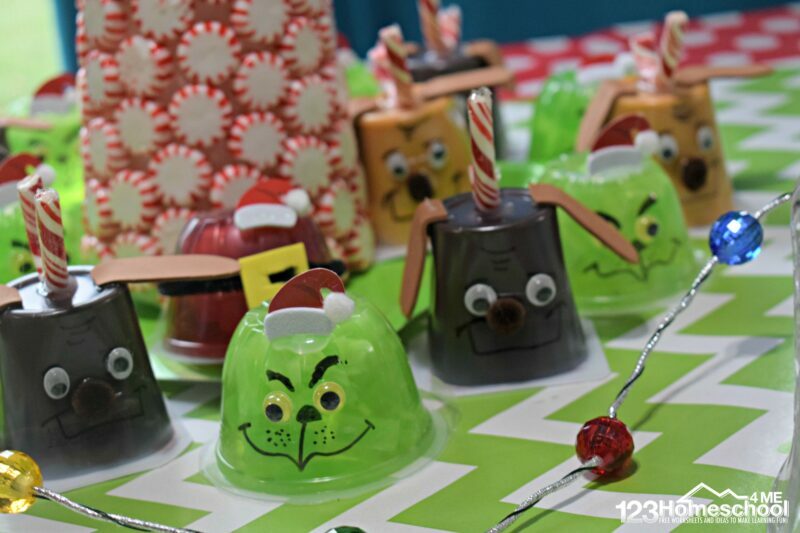 We recreated some favorite Mr. Grinch characters out of snack cups! The kids went crazy over these chocolate and butterscotch Max cups, lime jello and pear Grinch cups, and red jello Santa cups. I used a black sharpie and then used a hot glue gun to affix the googly eyes, brown foam ears, pom pom noses, and candy cane horn. 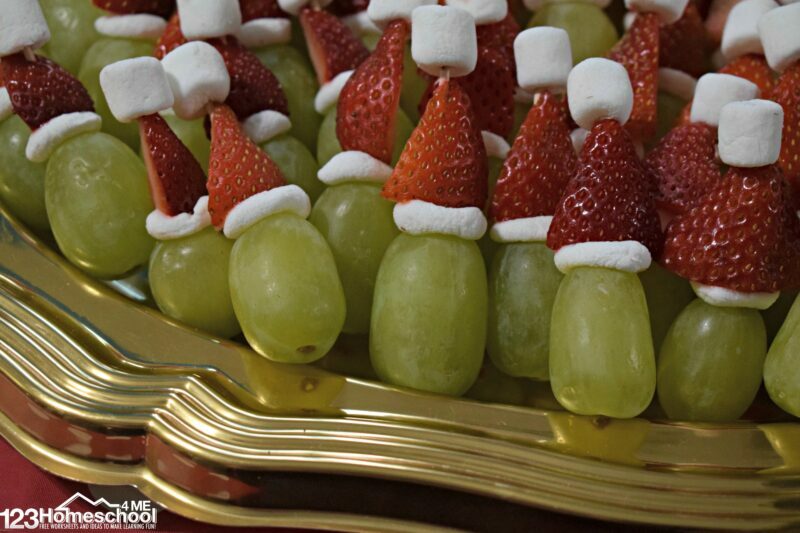 We made these cute Santa Mr. Grinch snacks by stacking on each toothpick: mini marshmallowsquartered strawberries, smashed mini marshmallow, and green grape. Cute and healthy snack! We added a more “main dish” food by cooking “spinach spaghetti” using package directions. We tossed it in a little butter, garlic, salt, and pepper. 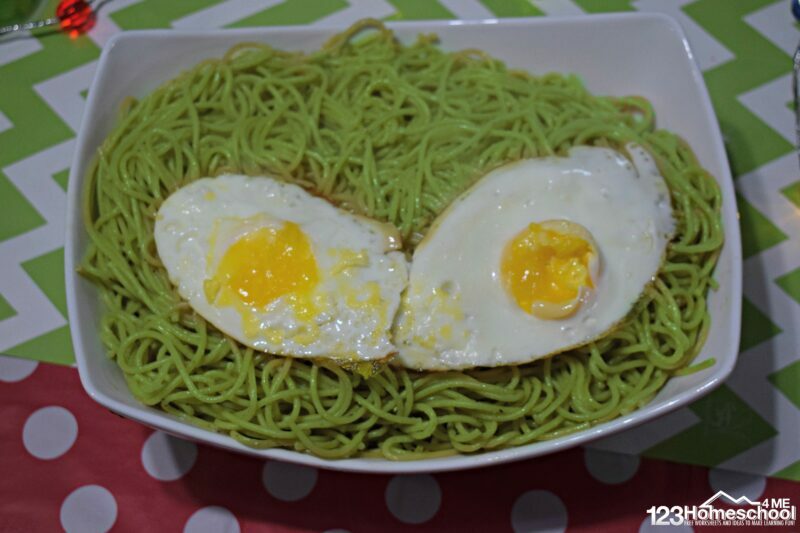 Then we put 2 fried eggs on top to make the grinch’s eyes. To make this festive main dish we started with spinach tortilla shells. Then we mixed 8oz tub of garlic & herb cream cheese with 1/2 cup mayo and spread it lightly all over the tortilla shell. Next we added 2-3 slices of roast beast per shell (roast beef for non Whooville residents; you’ll need about 1 pound). Then roll up the tortilla. Repeat to use up all the tortillas. Refrigerate the rolled up tortillas for 30+ minutes to make it easier to cut. Carefully slice into 2-3″ slices and start stacking up on a platter. Cut a start out of a pepper. Use remaining yellow along with red and orange pepper to cute small pieces as ornaments. 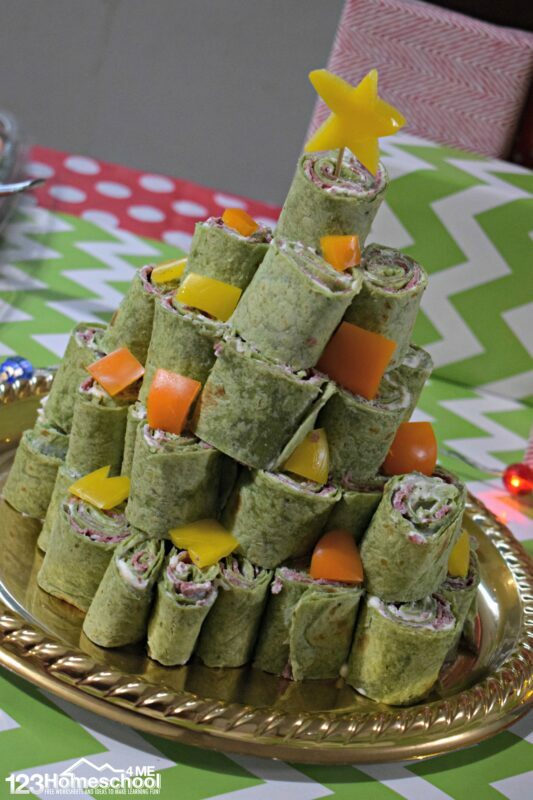 Decorate the sandwich tree. Refrigerate until ready to serve. 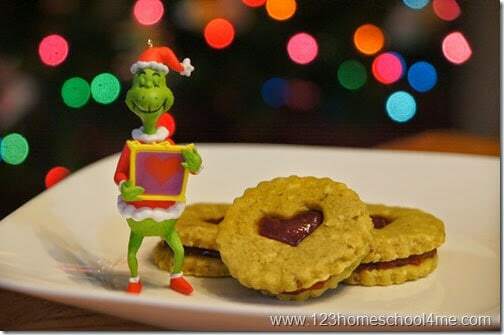 These super easy Grinch cookies are always a big hit. On a microwave safe plate set square pretzels. 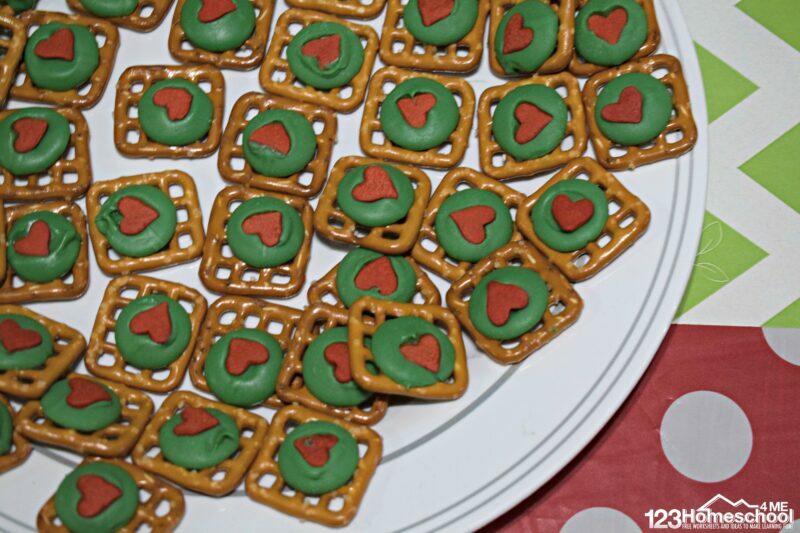 Place a green candy melt on top of each pretzel. Now microwave for 2 minutes at 50% power. 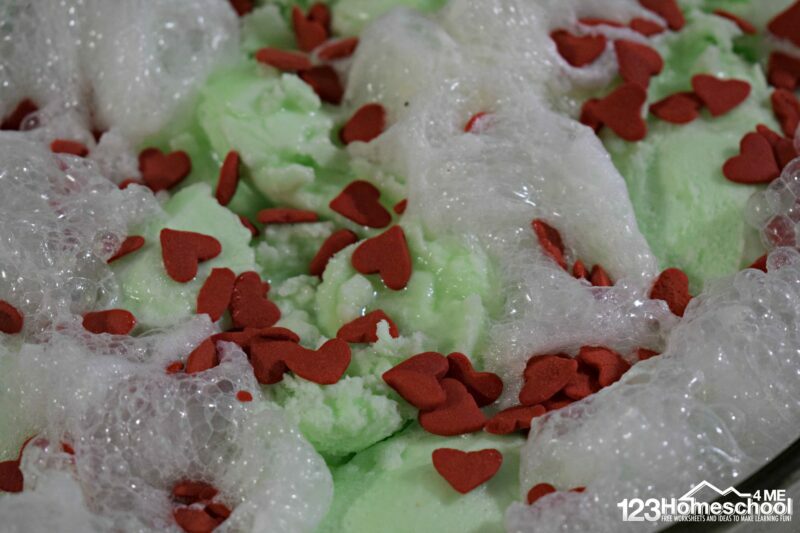 Pull out of the microwave and immediately set a candy heart on each green candy melt. Allow candy to cool / harden before serving or stacking to store. 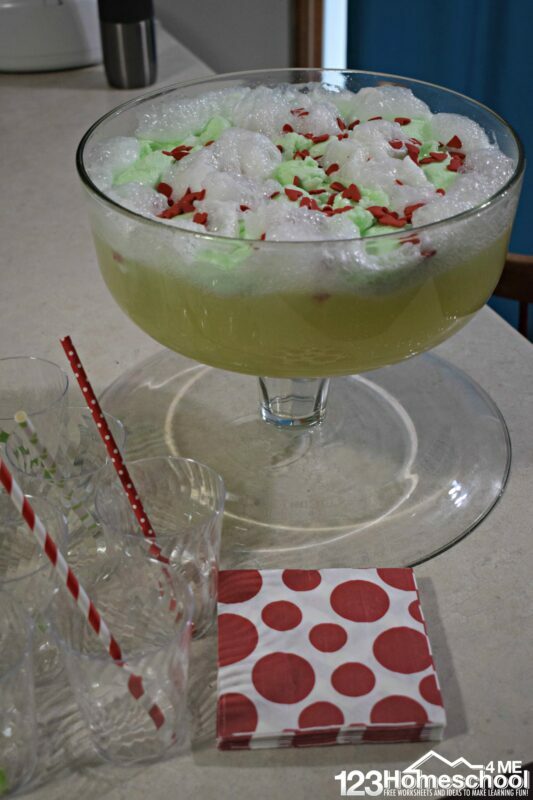 This cute Grinch Punch Recipe is super simple to make. Right before you are ready to serve, dump in a punch bowl mix a large can of pineapple juice, large bottle of Sprite, and spoonfuls of lime sherbet. On the top put leftover candy heart . How beautiful is that? This punch has a great flavor without being heavy or overly sweet. YUM! 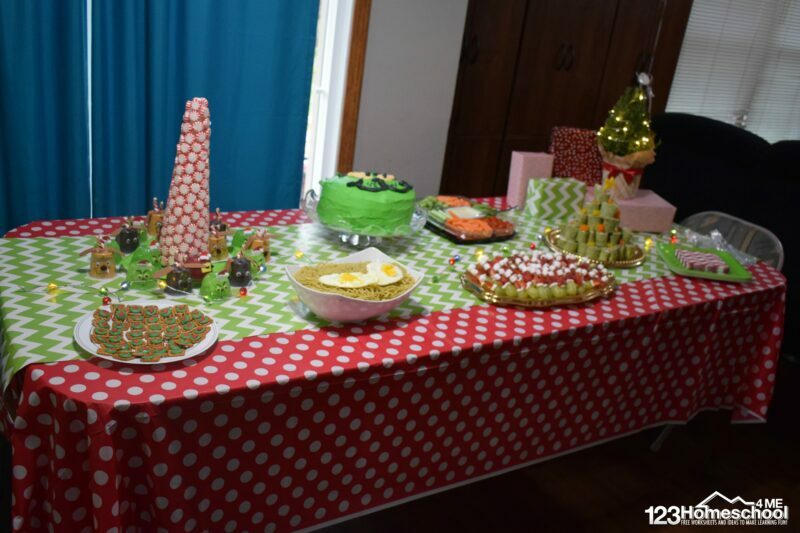 Here is our Grinch Party table. Simple, pretty, and delicious. We played up the fun colors and patterns from Whoville without going overboard on the Grinch face. Plus it was cheaper that way. 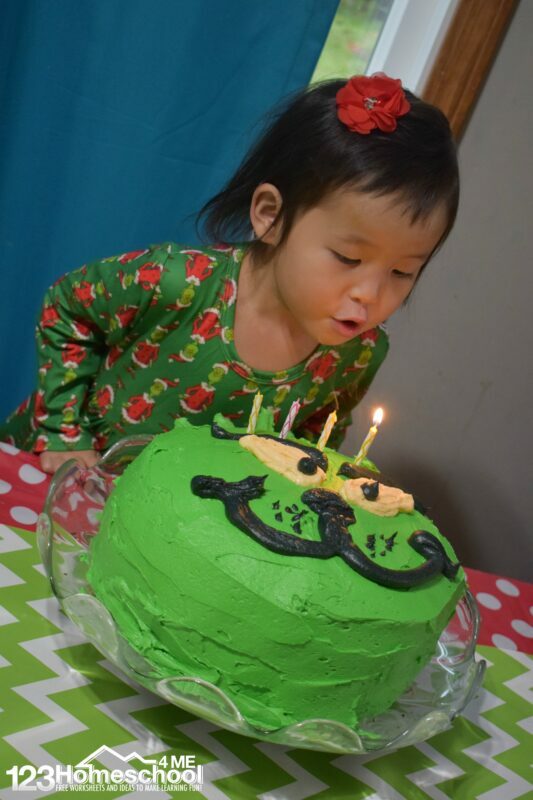 We used this disposable polka dot table cloth, green zig zag wrapping paper, green plates, red zig zag napkins, these Grinch dessert plates, and this cute Grinch balloon. 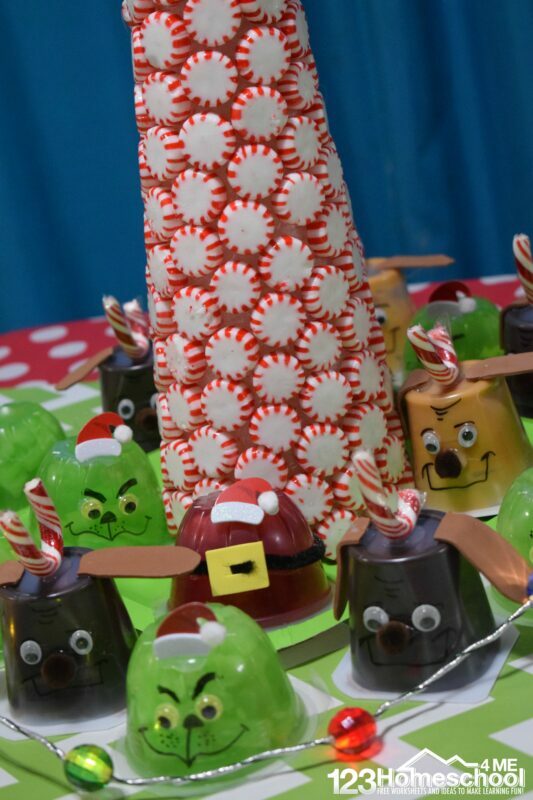 I made this super striking, and easy to make center piece by using a hot glue gun to attach peppermint candies to this Styrofoam tower. 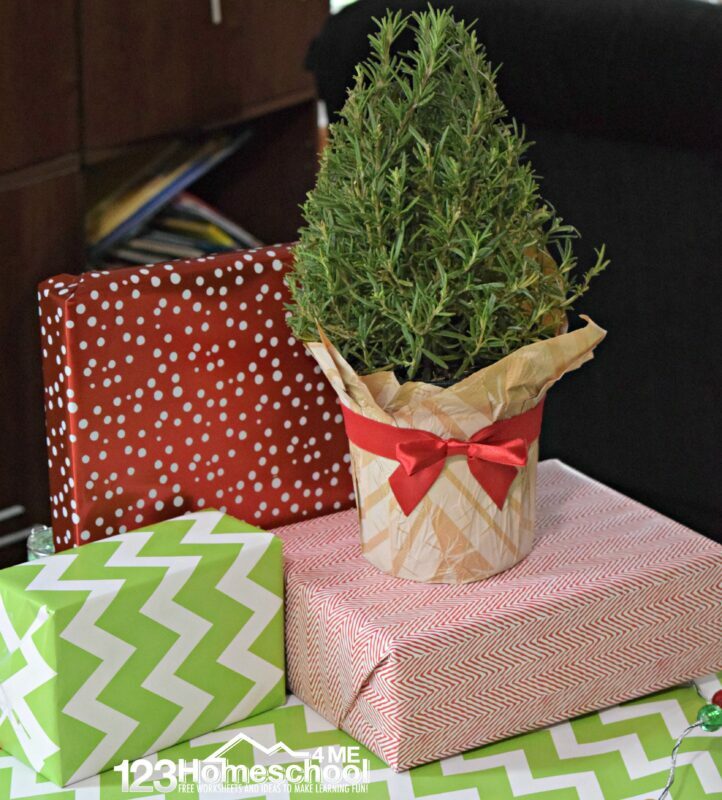 After the party, we use this as a pretty centerpiece all December long. I kept it simple with the birthday cake this year. Of course I used our famous buttercream frosting and made a simple face with tinted buttercream frosting piped through a sandwich bag. 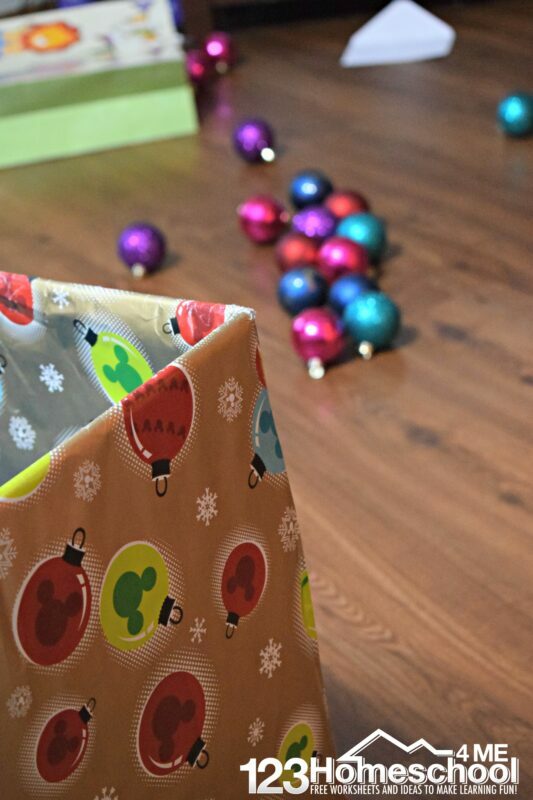 For this simple game, kids tossed shatterproof ornaments in a large, gift wrapped box. It was so simple, but the kids LOVED this activity. when the music stops, whoever has the present, moves to the middle of the circle until they switch places with the next child who ends up with the gift. 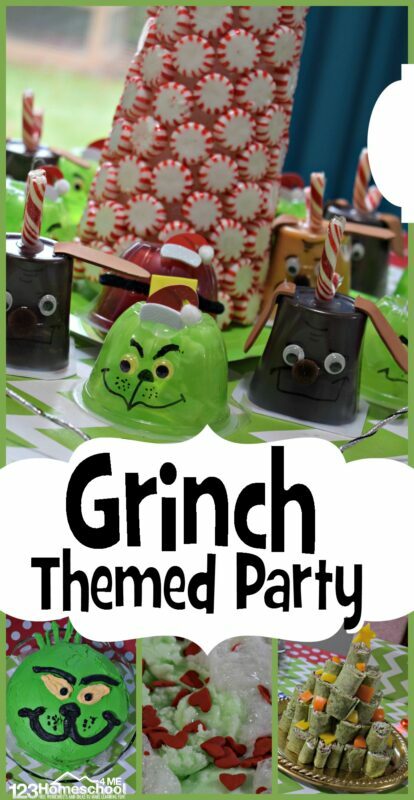 We hope you enjoy this fun Grinch Theme Party as much as we did!